Have you got a brand-new ereader, tablet, or smartphone? 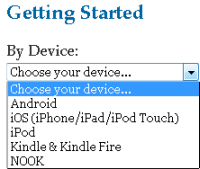 Want to download ebooks and audiobooks using Library2Go? Here's where to start. 1. Visit our Library2Go help page. You can find it on the wccls.org homepage by looking for the Download Books button. 2. You will need a valid WCCLS library card to access downloadable books with Library2Go. See this page (found under Managing Your Account on the help page) for details about library cards and Library2Go. 3. While you're at it, read Guide to your account on Library2Go (also found under Managing Your Account on the help page) to get a basic idea of how your Library2Go account works. 4. Ready to start downloading? We have step-by-step guides to walk you through the entire process of downloading to the most popular devices. You'll find these under Getting Started By Device on the help page. 5. Don't see your device listed there? Check to see if it's compatible with Library2Go. If it is compatible, try clicking on Getting Started by Format on the help page to get some tips for using Library2Go with your device. 6. Having trouble finding books that are available? Check out our guides to finding books that you can download right now under Finding Books to Download on the help page. 7. Have you run into trouble? Look at Common Issues by Device under Troubleshooting on the help page. Also check our archive of troubleshooting questions and answers in the middle of the page, closer to the bottom. You may find a solution there. 8. Still stuck? Contact your local library for the fastest service. You can also get help here.